After an upward blip in Q3 2017 corporate insolvencies have continued on their glide path down in Q4 2017 reaching historic lows as judged by both our National and East Anglian insolvency indexes. Meanwhile our East Anglia businesses in distress index nudged up one point. The National picture shows that corporate insolvencies dipped by 17.2% between Q3 2017 and Q4 2017 and 11.0% from Q4 2016. In East Anglia the corporate insolvency decline is greater still reducing by 28% and 28% respectively. Our MWW EA business distress index rose by 0.6% and 7.2% and a comparable National survey of businesses in "significant financial distress" reported increases of 10% and 36% from Q3 to Q4 2017 and Q4 2016 to Q4 2017 respectively. The growth of peer to peer and asset finance alternative lenders making it easier for distressed businesses to borrow more and move out of immediate financial danger. Higher interest rates, subdued consumer spending, reduced business confidence and generally tighter credit standards may be putting off investment or expansion plans which frees up short term cash to keep trading. Post Brexit export businesses are doing well lifting that cohort out of the corporate insolvency statistics. 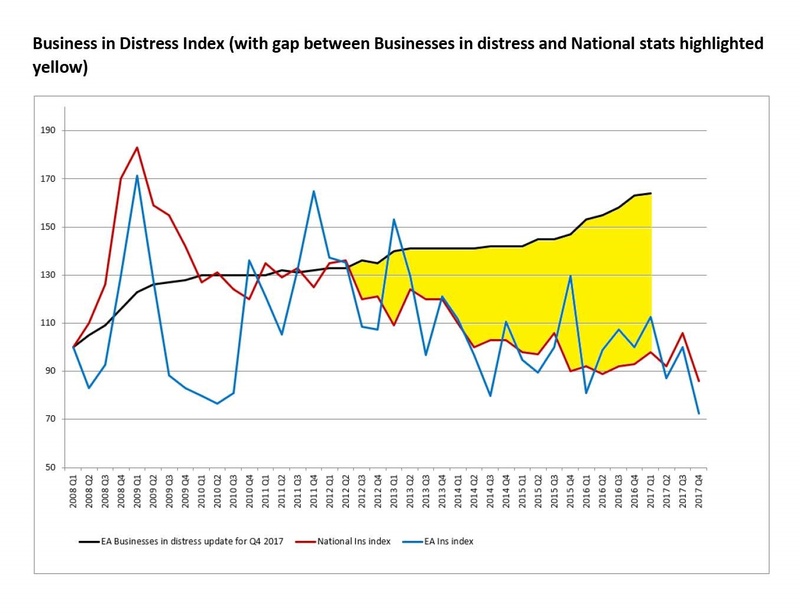 At some point the gap between the index of businesses in distress and the index of corporate insolvencies is going to narrow. Whether that is as a result of a reduction in the number of companies in distress or an increase in corporate insolvencies remains to be seen.